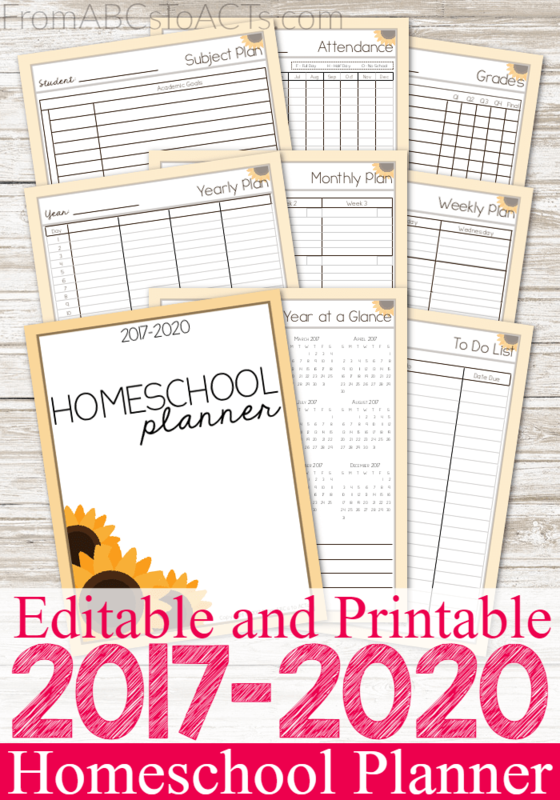 Make planning your next homeschool year a breeze with this printable, editable 3-year homeschool planner! Start the homeschool planning season off right with this printable, editable 3-year planner! With over 190 pages, you’ll find pages to help you plan yearly, monthly, weekly, or daily. Whatever works best for you and your family. Keep track of field trips, grades, reading logs, attendance, and even student assessments (if required by your state) all within a single planner! The best part? You don’t need to print off a single page if you don’t want to! The 3-year homeschool planner was made to accommodate up to 4 students at a time, with a separate student portfolio section for each, and is entirely editable. Simply click to add a photo to the front of each student’s portfolio section, or place your cursor within a calendar day to start typing out your lesson plans. Includes a student portfolio section for each of student that contains a place for your educational plan, subject plan, supply list, a reading log, a place to keep track of field trips, attendance, grades, and areas to monitor mid-year and end of the year assessments. Adding chores to your homeschool day doesn’t have to be stressful or overwhelming for anyone! Simply cut out and laminate these chore chart cards and use them in a hanging pocket chart for your child to work through throughout the day. Matching blank cards are included as well so that you can fill one with your child’s name and picture. The planner includes both a table of contents, located at the beginning of the file, as well as bookmarks that you can use in Adobe Reader to quickly and easily skip around to view the parts of the homeschooler planner that you need the most. See the planner post for more information on the various parts of the planner.